2 Fuse, specifications 2.5A / 250V, when the current in the circuit is too large, blown fuses to protect other components. 3 inductance coil (also known as choke), the main function is to reduce electromagnetic interference. 4 rectifier bridge, specifications for D3SB, the role is to 220V alternating current into direct current. 5 filter capacitor, specifications for 180μF / 400V, the role is to filter the DC to AC ripple, making the circuit more reliable. 6 op amp IC (Integrated Circuit), the protection circuit, voltage regulator important part. 7 temperature probe, power adapter for internal temperature probe, when the temperature is higher than a predetermined value (different brands of power adapter, and its set temperature threshold is slightly different), the protection circuit will cut off the adapter's voltage output, thereby protecting the adapter is not damaged. 8 power switch, is one of the core components of switching power supply, switching power supply can "opening and closing" to work, the switch contributed. 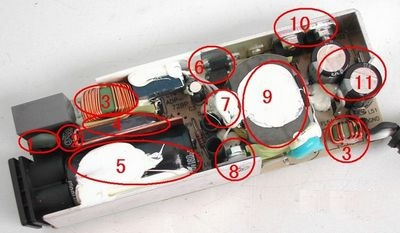 9 switching transformers,One of the core elements switching power supply. secondary rectifier function is the low-voltage alternating current into low-voltage DC. In Lenovo's power adapter, rectifier often work in parallel by two high-power, in order to obtain a larger current output. 11 secondary filter capacitor, specifications for 820μF / 25V, there are two low-voltage direct current from the filter effect of the ripple. In addition to these components, the circuit board as well as adjustable potentiometer and other RC components.